Japan’s Sharp said Monday that it has received a second $60 million investment from Qualcomm, as the two companies work together to mass produce low-power, high-performance displays for mobile devices. 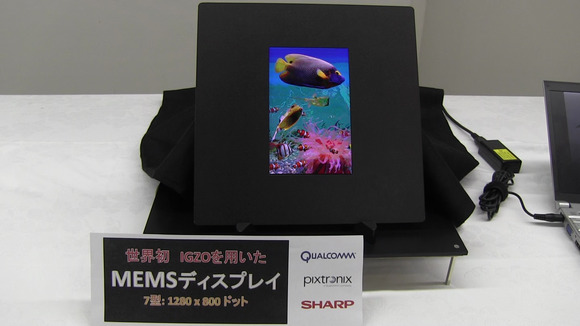 Qualcomm, through subsidiary Pixtronix, has teamed with Sharp to mass produce displays based on its MEMS (microelectromechanical systems) technology, the pixels of which are based on tiny mechanical shutters that flash open and closed to display colors. The technology has the potential for much faster response times and uses a fraction of the power required by LCDs, but cost-competitive manufacturing has proven difficult. “We are moving toward eventual commercialization,” said Sharp spokeswoman Miyuki Nakayama. The companies are still in the research phase and have announced no target dates. In a deal first announced in December, Qualcomm agreed to invest $120 million in Sharp in two blocks, the first of which was paid later that month. The second half was to be made in March if Sharp met certain guidelines for financial health and sufficient progress was made on the research, but that was postponed until this month. Traditional LCD screens have a white back light that sits behind an array of liquid crystal pixels, each paired with a color filter to allow light of a certain color to pass. MEMs screens use a back light that cycles through a sequence of colors, synchronized with an array of tiny shutters that serve as pixels, flashing open briefly to let certain colors through. The MEMS shutters have a faster reaction time than LCD pixels, and don’t require color filters so the back light needs less power to operate. Qualcomm has been trying to popularize the technology for years, and also sells a variety under the Mirasol brand with no backlight that relies on reflectivity. The deal makes Qualcomm one of Sharp’s largest shareholders, with a 3.5 percent share in Sharp. That is slightly more than Samsung Electronics, which invested $110 million in Sharp in March in exchange for a steady supply of LCD panels made for large screens. Sharp has made a series of deep losses and is seeking partnerships to steady its finances.